The season’s second conference is reaching its home stretch, and the time is ripe for us to look back and show our appreciation for the players who really stepped up and made their mark. The PBA has long been dominated by talented small men at the guard and wing positions, but, over the last couple of years, as more and more homegrown bigs enter the pros, we’ve seen a lot more rising stars playing as frontliners. 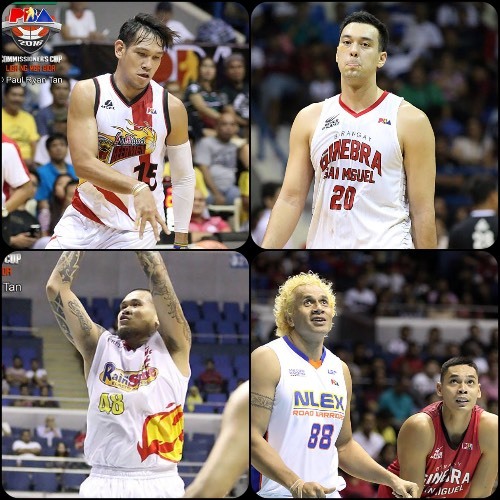 These are the players we’ll look at today — the current top bigs of the PBA. Note: All of the following stats are based on each player’s stats as computed by PBA-Online.net. They were taken on May 1, 2016. - Much of the noise this conference has centered on Arinze Onuaku and Chris Newsome for Meralco, but Hodge has continued to be a constant star presence. He remains perhaps the most athletic player on that team, and he will remain a vital cog for them moving forward. - Manuel has missed the semis series against Meralco, but up until that point he has been such an important player for Alaska. His injury hasn’t seemed to dampen the Aces’ play right now, but something tells me they’ll miss him of they manage to break into the Finals. - Ramos is one of the most underrated and underappreciated players in the PBA, but, despite that, he also continues to be one of the most versatile. Remember his hitting 6 threes as Mahindra beat San Miguel early this conference? That’s right. - The rookie from San Beda wasn’t expected to be much of anything on a team like Blackwater, but he has quietly become one of the club’s go-to guys on both ends of the floor. He can slide past bigger guys in the box, and he steals the ball like crazy on the opposite end. Wow. - Quiñahan has been playing like a man possessed for ROS this conference. His subpar outings in the semis notwithstanding, the Visayan product has been the Painters’ best local player for most of the Commish Cup. Everyone has forgotten about Beau Belga and Raymond Almazan because of how good Quiñahan has been. - In this, his third season with the Gin Kings, Japeth really seems to have finally found a home. He still isn’t a world-beater, but he has become the perfect frontline sidekick to Greg Slaughter. Greg can take care of all the scoring, while Aguilar will be in-charge of protecting the rim, cleaning the glass on the weak side, and running the break. - Wilson was amazing in the Philippine Cup, and though his numbers have taken a dip in the second conference, he remains one of the most efficient big men out there for Phoenix. He just plays much bigger than his 6’3 frame, and constantly finds ways to make good decisions on the court. - Asi is 43 years old and still averages a double-double. Please take him in for a drug test because he’s probably taking some secret stuff. - Yes, the reigning MVP isn’t the best big man this conference. Tyler Wilkerson has a lot to do about that, of course, but let’s also not forget that JMF has been playing through injury and he has already played 35 games this season — that’s more than many other players will play for the entire year! He may have been overtaken on this list, but, make no mistake, he is still a helluva tough assignment for anyone to cover. - Greg has been playing with a Greg-sized chip on his shoulder this whole season. He wants to prove that, yes JMF is the MVP, but, hey, Greg ain’t nicknamed Gregzilla for nothing. Slaughter has been having the best season of his young pro career, and despite losing in the quarters this conference, I think his play will just get stronger as the season goes on. Watch out, folks, he may just be Season MVP by the end of the Govs’ Cup.